You’re tuning into The Monster Theory Podcast, Episode #7. My guest today is going to make you tear up and tug at your heart because her story is one of heartbreak and breakthrough… essentially it’s about the power of the human spirit and resilience. When you are faced with news that can shatter your world, it is in those moments that you get still and get in alignment with God, the universe, and your higher power!! Her story is going to make you reflect on your own life, your own sense of ... See More self, your own higher power and the will of your own spirit! You know this podcast is about facing our greatest fears, our monsters. And I’ll be the first to tell you that sometimes it’s very, very hard to do! But when you hear stories like the one you’re about to hear from Rosanne Pappas, know that she’s going to raise your level of stamina and belief that no matter what you’re going through, you can overcome it. Rosanne is a mother, an artist, a writer and an international speaker whose story is not only going to move you, but her honesty and vulnerability is going to captivate you and inspire you to take a closer look at your own journey and story. 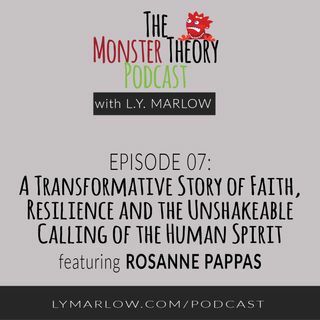 And let me say this… I’m purposely not telling you much about her story in this introduction because I can’t do it justice… I want you to hear first hand from her… So without further ado, let’s meet the Amazing and Transformative Rosanne Pappas!